This security poster illustrates the M14 United States Anti-Personnel Mine. One of the smallest anti-personnel mines made, the pressure operated M14 contains a very small quantity of explosive because the mine is designed to maim rather than kill. The mine operates using a ‘bellville’ spring mechanism, and this mine is extensively copied by other countries. 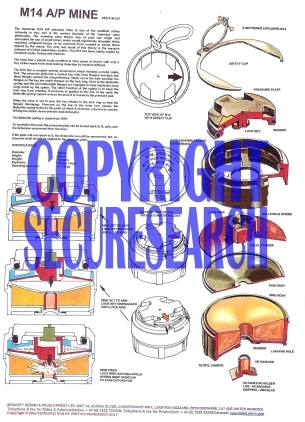 This security poster features the technical specifications of the M14 anti-personnel mine, a sectioned, exploded M14 with the parts labeled, and the top view of the M14 with safety clip as well as the bottom view of the mine with detonator holder. The security poster also contains side views and sectioned views of the M14 when the mine is set to safe, when the mine is set to arm, and when the mine is fired. A sectioned, exploded M14 with the parts labelled. The top view of the M14 with safety clip and the bottom view of the mine with detonator holder. Side views and sectioned views of the M14 when the mine is set to safe, when the mine is set to arm, and when the mine is fired. The technical specifications of the M14 Anti-Personnel Mine. This security poster features the technical specifications of the mine, a sectioned, exploded M14 with the parts labeled, side views and sectioned views of the M14, and the top view of the M14 with safety clip as well as the bottom view of the mine with detonator holder.